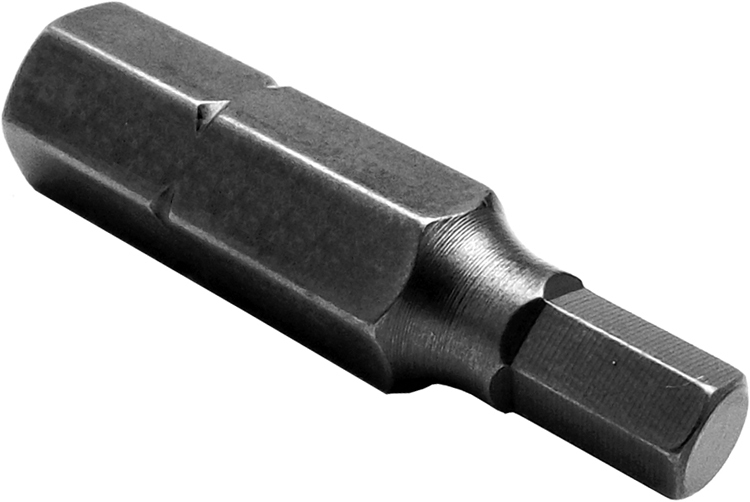 Zephyr Slotted (Hex-Allen) insert bit 1/4'', 5/16'' hex shank, aircraft intermediate hardness, 1 5/16'' overall length. The socket head bit is one of the most common popular screw drives in the aviation and automotive industries. This screw drive is also common in heavy industry environments. Zephyr Slotted (Hex-Allen) insert bit 5/32'', 5/16'' hex shank, aircraft intermediate hardness, 1 5/16'' overall length. Zephyr Slotted (Hex-Allen) insert bit 5/32'', 5/16'' hex shank, extra hard, 1 5/16'' overall length. Zephyr Slotted (Hex-Allen) insert bit 3/16'', 5/16'' hex shank, aircraft intermediate hardness, 1 5/16'' overall length. Zephyr Slotted (Hex-Allen) insert bit 3/16'', 5/16'' hex shank, extra hard, 1 5/16'' overall length. Zephyr Slotted (Hex-Allen) insert bit 7/32'', 5/16'' hex shank, aircraft intermediate hardness, 1 5/16'' overall length. Zephyr Slotted (Hex-Allen) insert bit 7/32'', 5/16'' hex shank, extra hard, 1 5/16'' overall length. Zephyr Slotted (Hex-Allen) insert bit 1/4'', 5/16'' hex shank, extra hard, 1 5/16'' overall length. Zephyr Slotted (Hex-Allen) insert bit 5/16'', 5/16'' hex shank, aircraft intermediate hardness, 1 5/16'' overall length. Zephyr Slotted (Hex-Allen) insert bit 5/16'', 5/16'' hex shank, extra hard, 1 5/16'' overall length. Zephyr Slotted (Hex-Allen) insert bit 3/8'', 5/16'' hex shank, aircraft intermediate hardness, 1 5/16'' overall length. The H5237A Zephyr 5/16'' Socket Head (Hex-Allen) Insert Bits, For Machine Screws is one of thousands of quality tooling products available from MRO Tools. Please browse Zephyr Socket Head (Hex-Allen) Insert Bits for tools similar to the H5237A Zephyr 5/16'' Socket Head (Hex-Allen) Insert Bits, For Machine Screws. H5237A Zephyr 5/16'' Socket Head (Hex-Allen) Insert Bits, For Machine Screws description summary: Zephyr Slotted (Hex-Allen) insert bit 1/4'', 5/16'' hex shank, aircraft intermediate hardness, 1 5/16'' overall length. Quantity discounts may be available for the H5237A Zephyr 5/16'' Socket Head (Hex-Allen) Insert Bits, For Machine Screws. Please contact MRO Tools for details.